When the Saudi prince Khalid Abdulla decided to name one of the hundreds of horses that race around the globe in his green, pink and white silks Frankel, he wanted him to be good. Very good. After all, Robert J. Frankel, the colourful American trainer known to most as 'Bobby' after whom he was to be named, had himself been a legendary figure. 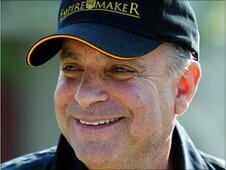 Prior to his death from cancer aged 68 in 2009, Frankel had won US racing's Eclipse Award for outstanding trainer five times, becoming one of only two in his profession to smash the $200m prize money barrier. Abdulla had delighted in his company as well as their success together, notably with Belmont Stakes winner Empire Maker and the Breeders' Cup-winning mare Intercontinental. 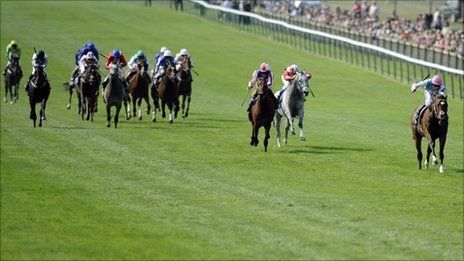 Frankel the horse is certainly not letting down the memory of Frankel the man. His all-the-way victory as 2-1 ON favourite in the Qipco 2,000 Guineas - the shortest odds in the race in modern times - was amongst the most monstrously brilliant performances ever in British racing history. It's traditional on these occasions to 'hold on' to a horse's energy reserves for the end of its race rather than blast into the early lead that jockey Tom Queally decided to grab. Eyebrows were raised about the tactic especially when the horse, which has had a tendency to over-exert himself by doing battle with his rider, was 12-15 lengths in front of his rivals halfway through the mile. But in quite staggering style he stayed there, and was six clear at the finish. It was bold and it was brilliant, and it sparked off the kind of scenes of sheer joy rarely witnessed at Newmarket. The crowd, basking in warm East Anglian sunshine, started to roar its approval when there was still fully a furlong (200m) to be covered by the colt, which was improving his record to six wins from six starts. Afterwards, people who never really do that sort of thing broke into a trot to make it back in time to greet the new hero in the winners' circle. 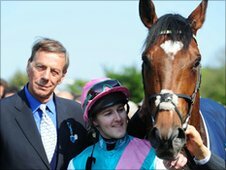 And although undoubtedly expressing admiration for the devastating nature of Frankel's success, they had something else even higher in their minds: to bellow approval for his trainer Henry Cecil. Racing adores the 68-year-old who was tasting success in a British Classic for the 25th time. Hugely successful, with 10 trainers' championships to his name, Cecil has also endured a series of low points, including his own brave battle against stomach cancer, but has stubbornly refused to surrender. That courage, plus the fact that although clearly something of a patrician by birth, he has a distinct man-of-the-people touch, has made him little short of an iconic figure. Obviously touched by the reception, Cecil invented a new word "weepish" to describe his emotions before shyly conceding Frankel was amongst the very best. The respected Timeform organisation of analysts went even further, rating the colt's performance as better than anything demonstrated by the great champion Sea The Stars throughout 2009. The big question now is what next? It looks like the St James' Palace Stakes at Royal Ascot (again over a mile) rather than the Epsom Derby (half a mile further) before stepping up in distance to a mile and a quarter, probably in the International Stakes at York in August. If he stays in the kind of heart demonstrated so vividly in the 2.000 Guineas he will sail through the season, carrying all before him. And at the great racecourse in the sky, how proudly must Bobby Frankel be looking down on his equine namesake as greatness beckons ever more urgently.